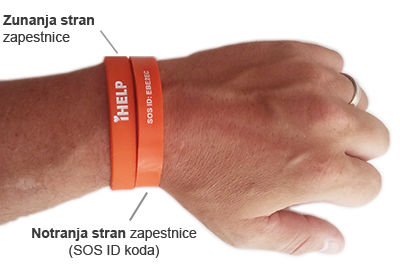 iHELP bracelet has a special SOS ID code. Through SOS ID code rescuers can immediate access to medical data (diseases, allergies and medications) from the victim. SOS ID code is hidden in the inside of the bracelet. 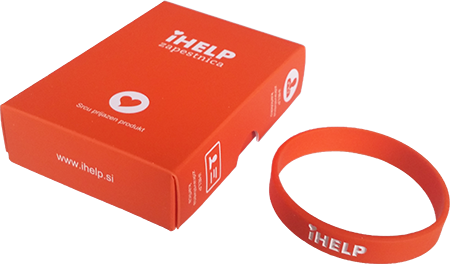 By buying bracelets you help us to build a network of defibrillators. Order a bracelet and you'll increase your safety at home and on the road. Unique SOS ID code, Medical record is only available in English, 24/7 access to data through the application and website. Medical record editing. Free yearly licence for Assistance HOME (the amount of annual license: 9,90 EUR). In the app you can add five (5) emergency contacts. Sends SMS alarm to your emergency contacts (ICE). Free annual license of the Premium package (worth 30,00 EUR). On the health card write your own health information (value card: 4,90 EUR). With each purchase of iHELP Diners Club credit card will devote funds for the defibrillator.